You will pucker up with these sour conversation beans from Jelly Belly. Each box of conversation beans has sweet sayings imprinted on them to let the love of your life know you care. 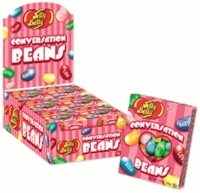 Each box of jelly beans has an assortment of lovable sayings like "Love""Kiss""Hug""Baby" or "I DO "
Instead of giving that person you are sweet on the usual conversation hearts, this year how about some conversation beans. Not only are they chewy, but also sour for some serious pucker up time. These are perfect not only to give to your sweetie, but also a lot of fun to hand out at class room parties. Each box is 1.6 ounces of fun.